The country is reducing its dependence on fossil fuels – and the heating and hot water sectors can take their share of praise with many products now almost at the limit of achievable levels of energy efficiency. However, we still need to tackle overall building services system efficiencies and deliver further reductions in direct emissions. Pushing on to the next stage will require designers and installers to consider how their work fits into the ‘bigger picture’ of total system and lifetime operation. Regulation is also keeping us on our toes. 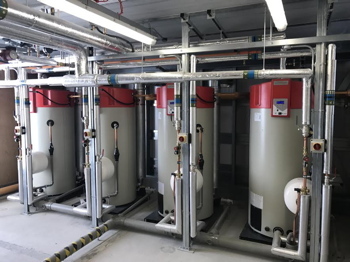 Since September, all new commercial gas water heaters have been subject to a maximum nitric oxide and nitrogen dioxide (collectively classified as NOx) emission level of 56mg/kWh for the first time – as a result of changes to the European Energy-related Products Directive (ErP). This applies to natural gas and LPG water heaters on both new build and replacement projects. All products need a declaration of conformity; a supporting technical file to show compliance; and must display the CE label. It is now also the responsibility of the manufacturer or their authorised representative to provide the necessary evidence of compliance. Also, as an industry, we are committed to the EU’s targets of a 27% increase in energy efficiency and 40% reduction in greenhouse emissions by 2030. Clearly, we have to manage the ‘trade off’ between reducing energy consumption and minimising NOx without piling cost onto the end users. Condensing technology is helping, but condensing products on their own are not enough. Also, contractors need to be mindful of the fact that end users have their own priorities. For example, replacing a water heater is often a distress purchase and the primary concern for the end user is to get the building’s hot water supply up and running as quickly and reliably as possible. This means managing the cost of a replacement is crucial and one of the main difficulties in upgrading to a condensing water heater solution, for example, is that a complete new flue installation may be required, which can add significant cost. It can also mean more ‘hot water downtime’, which for owners and managers of hot water intensive buildings, like care homes, hotels and leisure centres, is an extremely serious prospect. They may not have the time or the budget for the additional installation work that may be required and this means the industry needs to remain flexible and open-minded. Therefore, the offered solution needs to be presented in terms of its financial benefit – in both the medium and long-term. This strengthens the case for deploying integrated and hybrid systems in which conventional and renewable systems are combined with a traditional gas-fired solution. They reduce running costs and extend the life of the equipment by ensuring the gas consuming technologies are only used at times of peak demand. An integrated or hybrid solution is also a good way to keep initial capital outlay relatively low – when compared with renewableonly solutions – and means some end clients, who might previously have considered renewables to be beyond their budget, can afford a renewable element. More specifiers are also making wider use of multivalent systems where energy is gathered from a number of separate sources including solar thermal, heat pumps, and condensing gas-fired boilers and/ or water heaters. The more we strip carbon out of our electricity, the stronger the case for heat pumps that use electricity as a primary fuel source. They can also deliver energy savings of between 25% to 40% and payback times of five to 10 years depending on the type of building. Heat pumps work particularly well if they are integrated with a condensing boiler to provide low temperature hot water for underfloor heating or low temperature radiators, and the use of weather compensation control in the heating mode will also enhance system efficiency. In such a system, the use of a suitably flexible and properly sized thermal store becomes the critical element. 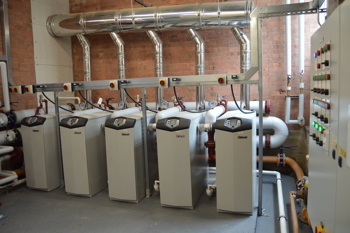 The integrated system set up ensures that the heat pump will supply the main heat load, and the non-renewable plant e.g. gas condensing boiler, only runs at times of particularly high demand or during very cold periods – so minimising fossil fuel use. The thermal store acts as a large, low-resistance header that can accept heat from up to three sources. This smooths out the system capacity to maximize efficiency. It also reduces legionella risk because it does not store domestic hot water for long periods. Ideally, the store should be sized to provide 20 litres per kW output from the heat pump, plus an additional 10 litres per kW output from the system boiler. This approach is not particularly challenging in a technical sense, but it does require proper pre-planning and assessment of the usage patterns within the building and, therefore, the likely best configuration for the system. Combining multiple technologies in integrated designs raises the prospect of the industry being able to achieve results that are even more impressive in the future.